Posted February 17, 2017 by Louis Rabinowitz & filed under Episodes. Legion entered the fray with a premiere episode that hit critics and viewers alike completely by surprise – captivatingly unusual and thrillingly innovative in a way no superhero show on TV has come close to matching. But a lot of that pilot’s appeal rested in the shock of the new. Could Legion make the hop to a weekly series with its uniqueness intact, or would it have to settle down into something more conventional? Rest assured, ‘Chapter 2’ answers that question – Legion isn’t falling into a traditional narrative any time soon. Beginning with the simple hook of David’s arrival at a strange resistance force in the woods, it soon corkscrews into a non-linear narrative just as format-busting as the pilot’s was. But there’s also a little more rhyme and reason to the narrative this week – a central theme, a clearly-defined relationship for David, and the arrival of a few characters to begin to clean some of the mess of David Haller’s mind up. If ‘Chapter 1’ was a headfirst plunge into David’s mind with all the disorientating unfamiliarity that brought about, then ‘Chapter 2’ begins with more of a controlled descent. We’re back in the depths of his mind, but with a defined objective in finding particular memories, and with capable allies on hand to provide guidance and stability against a tangible enemy in the form of the malignant Division who are hunting David. Even when it’s just laying out the episode’s premise, the imagination and visual craft apparent in every frame is truly impressive. It’s because Legion is willing to dip into the genre sandbox for ideas like the ‘museum tour’ through David’s memories, a concept that wouldn’t be out of place if it had Professor X at its centre, but places these ideas within its own unique framework, using them not as emblems of wonder and excitement but instead as the doorway to the terrifying chaos that lurks in David’s subconscious. We’re just as likely to stroll into a dreamy childhood memory in this section as we are into a bedtime story that oozes undefinable creeping dread, and the uncertainty of tone means that, soon enough, there’s never any comforting mood for us to find as an anchor. It’s not long before ‘Chapter 2’ segues into a thoughtful exploration of the formative power of memories and the idealistic notion of revisiting our experiences from an objective viewpoint into the cold, hard reality that memory is not controllable, least of all for someone with a terrifying power that he can’t even begin to comprehend. We might think we want to do something, after all, but as ‘Chapter 2’ so powerfully shows, there’s something deeper in the mind that has the final say, such as the subconscious force that shuts out the most pertinent memory to understanding David’s powers. This shift from power to powerlessness exemplifies the way in which ‘Chapter 2’ paces itself in a much more conventional way than last week. The episode is constructed in a way that David’s character is opened up more methodically than the intentionally intermittent insights that last week’s introduction provided. While it’s by no means a story that’s ever simple to understand – David’s descent into panic and uncertainty is a blitz of flashbacks and flashforwards and possible hallucinations that’s barely possible to comprehend – it’s a story with goals that are much easier to perceive. What ‘Chapter 1’ did worked for an opening episode, but it’s good to see Legion is evidently working towards something tangible now that it’s raced out of the starting blocks. Meanwhile, ‘Chapter 2’ manages to build nicely upon some of the foundations, both in terms of the show’s relationships and mysteries, set up last week. David’s relationship with Syd continues to be a beacon of honest, trustworthy sincerity within the madness. It’s nice to see that, despite the ambiguous ending of the pilot, Syd doesn’t appear to have an ulterior motive. She genuinely likes David, and David genuinely likes her back, and that simplicity is communicated with the nervous, tentative but utterly believable chemistry between Rachel Keller and Dan Stevens. It’s no surprise that it’s with Syd that David has his only moment of total control over his powers. Likewise, the role of Aubrey Plaza’s Lenny, left totally up in the air after she got stuck in a wall and died (as these things tend to do), became more tangible here. She is, or was David’s id, egging him on to capitulate to his instincts, and to cast off the tightly-wound repression that’s marked his life, and David’s fluid, non-linear memory ensures that her influence still holds considerable power over David’s actions in the present. It’s the kind of role that’s in Plaza’s wheelhouse, but her performance is impressively unfamiliar, stuck halfway between a jittery instability and relaxed complacency. Intriguingly, Lenny, alongside Syd and Melanie, the therapist played by Fargo’s Jean Smart, seems to be forming part of a web of influences that are all pulling David in notably different directions, and it’ll be fascinating to see just who wins out in this complex push and pull over his will. And then there’s the cloud of mystery that remains. The main question mark hanging over Legion – besides ‘what is going on?’, obviously – is the elephant in the room. Or rather, the terrifying yellow devil in the room. This hellish apparition popped up last week, and he’s clearly becoming a constant fixture of David’s psyche, appearing to knock David’s psyche into a chaotic spiral and then vanishing as it if never appeared. If we’re meant to assume everything in David’s mind that was presumed to be delusion is actually real, then just who is this creature? ‘Chapter 2’ isn’t without its flaws. The craftsmanship on display is indisputable, but outside of the very tight-knit world of David and Syd, the show can feel a little emotionally chilly. His sister’s kidnapping is a moment of terror for him, but Legion’s structure hasn’t allowed for us to get to know her enough for the twist genuinely shocking – indeed, the first time she actually appears in this episode is when her predicament is revealed. Legion’s idiosyncrasies are a double-edged sword, and one of the main drawbacks is that it’s not equipped to do things that simpler shows can pull off much more easily, such as the cliffhanging twist we get here. It’s a small weakness, but one that will need to be overcome at some point. Sure, it’s difficult to escape the idea that this is television that almost doesn’t want to be understood. Legion makes you work for every character beat, and upends everything as soon as the viewer settles into a comfortable rut. That might be frustrating for some who just want a thrilling, linear superhero story ripped out of the comic books. Yet that unapologetic boldness feels just right for this twisted vision of the X-Men universe. ‘Chapter 2’ isn’t quite as dazzling as the pilot, but it maintains the thrill of the unexpected and puts some important building blocks of a more coherent and perceivable narrative rulebook for the weeks to come. 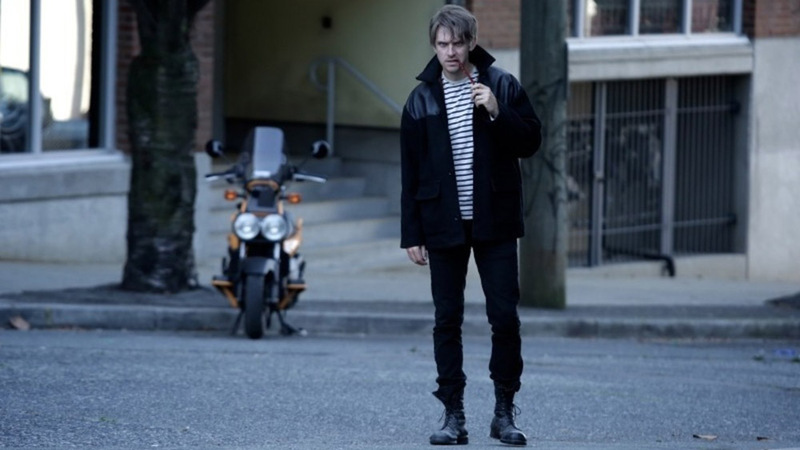 David might be fumbling for answers, unsure of his memories and his present, but as this episode shows, Legion doesn’t have any uncertainty about where it wants to go. Aired at 9pm on Thursday 16 February 2017 on FOX.